In case you weren’t one of the 56 million people around the country watching the NFC Championship last Sunday (and why weren’t you?! ), allow me recap things quickly. After three hours of back-and-forth, drama-filled, heart-wrenching football, one play ended a feverish comeback from the San Francisco 49ers and catapulted the Seattle Seahawks into Super Bowl XLVIII. The play defined the game, likely the Seahawks’ season, and most definitely introduced the world to Seahawks All-Pro defensive back, Richard Sherman. And as the reaction of Steve Raible, the “Voice of the Seahawks,” might suggest, we’re just a touch excited. 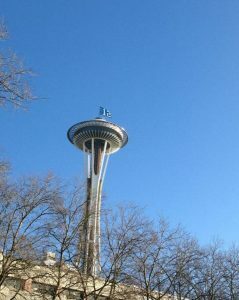 The 12th Man flag has been a fixture atop the Space Needle in recent weeks. Photo: Ali Daniels. I would imagine some people from around the country are wondering: “What’s so special about the Seahawks’ playoff run? Two teams play in the Super Bowl every year. Why are they freaking out in Seattle?” The answer is pretty simple, actually. Our Seahawks have created a relationship with the community that no other destination will ever experience. We are the 12th Man and we take our job very seriously. You’ll find our colors flying high from buildings, in storefront windows, on cars all over the streets, and on every person in town each “Blue Friday.” The Seahawks haven’t just connected with sports fans, though. The entire city is on board. In fact, 85% of TVs in Seattle were watching the NFC Championship game. Like I said, we’re just a touch excited. So what’s next? The Seahawks flew east for New Jersey and continued to prepare for the biggest game of their lives. Every Seattleite wished they were on the plane with them. After a week of worldwide media scrutiny, several of the Seahawks players will likely become household names. The 12th Man will probably have its time in the media spotlight, too, celebrated for giving our team the best home-field advantage in sports. Eventually there is actually a football game to be played and it should be a great one. Regardless of the result, though, take a moment and understand what has happened this January. Seattle has become unified these last couple of weeks and everyone has risen to the challenge of showing the country what the 12th Man is all about. This is a rare opportunity—for an entire city to gravitate towards one common interest—so don’t let up, we’re going to the Super Bowl! A trip to the Super Bowl is a special opportunity and one we couldn’t pass up at Visit Seattle. 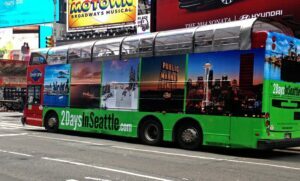 While the 12th Man was out celebrating an NFC Championship Sunday night, some buses in New York City were getting a new look. We’re inviting New Yorkers and all those Super Bowl fans from around the world to come spend 2 Days in Seattle. And our message will be tough to miss, seeing as though it’ll be running up and down “Super Bowl Boulevard” from now until the big game. If you’re like most fans, watching the Seahawks in person at Super Bowl XLVIII isn’t a reality. No reason to worry, though, as a slew of Seattle bars, restaurants, attractions, and hotels have pulled out all the stops to make watching the big game here an awesome experience. Whether you’re visiting for the weekend or already in town, check out a full list of partners with Super Bowl specials.